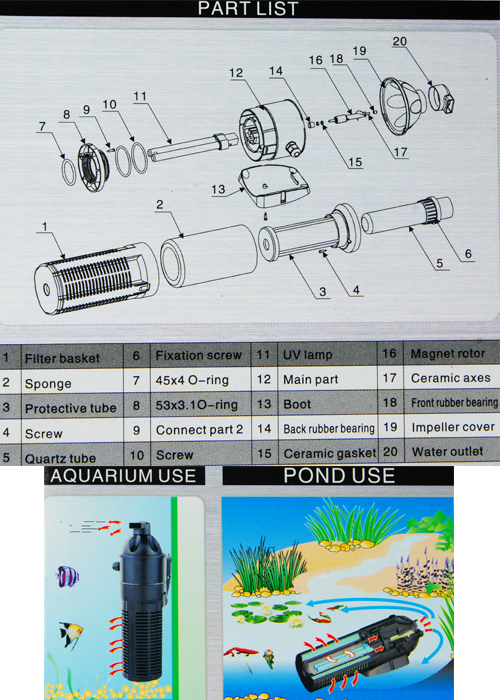 •	OUR Unique/Genuine AAP Internal (Submersible) UV Sterilizer Pump/Filters are unlike earlier versions of Submersible Internal UV Sterilizers for Ponds or Aquariums that our associated Aquarium Maintenance Companies tested, and which failed these tests due to leakage and poor flow rate and design (for optimum Level One UV Sterilization) resulting in at best green water control, but not level 1 UV Sterilization. •	However our AAP/SunSun CUP-613 & CUP-609 WITH HO UVC Lamps are better engineered than the first generation Internal UV Sterilizers by other companies. 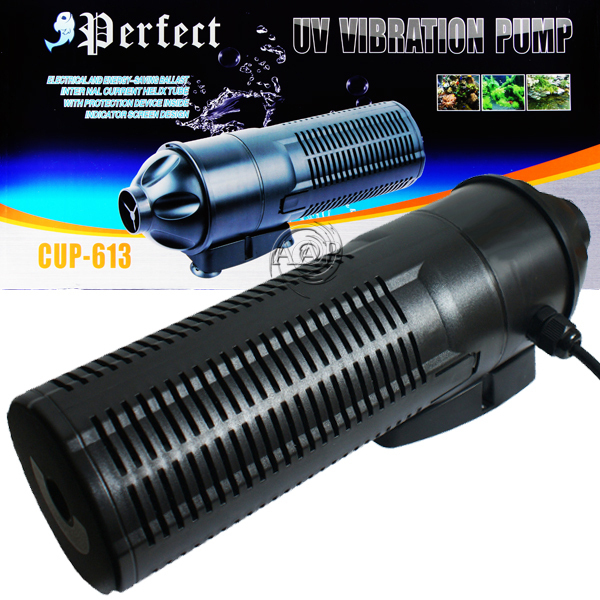 Both the CUP-613 13 Watt & CUP-609 9 Watt SunSun UV Pump/Filter passed our scrutiny due to flow tests. With OUR flow rate tests/adjustments these were the first Internal/Submersible UVs to actually perform optimum level 1 Sterilization (which is/was a problem with all the other brands we have tested). However even the CUP-609 and CUP-613 both have flow rates that can reach only Level One sterilization (NO Internal UV Filter /Pump can achieve level 2 sterilization as can be achieved with a top notch UV (such as the "Category A" TMC Vecton/Advantage) mated to a correct flow rate pump as per wattage of the given UV. It is also should be noted from our extensive UV Sterilizer experience & research that while an excellent out of the box "True" UV Sterilizer, these should be looked at as a "throw away" UV when compared to a top notch Category "A" UV such as the AAP Vecton which will last a decade or more. 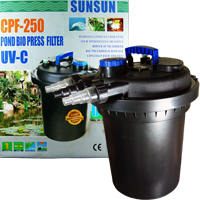 That said, this specific model AAP/SunSun Internal Pond/Aquarium UV Clarifier/Sterilizer is the BEST in its class. These are far SUPERIOR to those sold on Amazon and the plethora of low end Aqua websites, as most of these are similar models, but lacking the correct flow and pattern. As well MOST of these other CUP series submersible UVs sold elsewhere do NOT come with the sponge pre-filter that is ESSENTIAL to lower water turbidity thus increasing 254nm UVC efficiency and often are supplied with a MUCH lower output medium pressure UV Bulb to allow the UV to be sold at a certain price point! 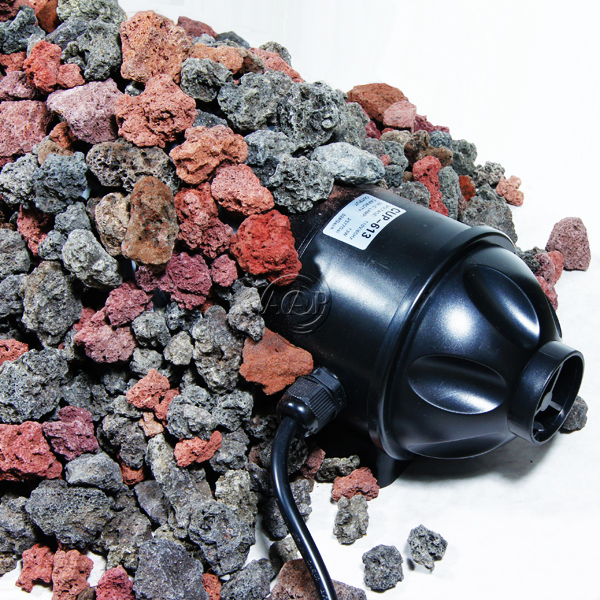 We provide the sponge pre-filter and more importantly, a quality high output low pressure UV Bulb/Lamp with our CUP series Submersible UV Pump/Filters. The flow design of OUR SunSun Submersible UVs IS top notch for this type of self contained UV Filter/Pump with its well designed sponge filter for pre-filtration mated to this UV Pump/Filter (also Level 2 Sterilization does not achieve many benefits past Level 1). 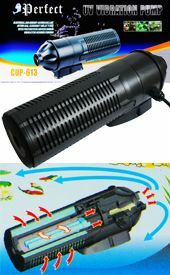 This makes these SunSun Submersible UV Sterilizers an excellent idea for those who desire a reasonably good UV that is "Plug and Go" right out of the box! EXCELLENT for Patio Ponds too!! *We do NOT recommend NOR SELL the SunSun or similar PH-8/UV-3, UVP-5, UVP-7, & UVP-9 submersible UV sterilizing pumps as these have too much in common with the other earlier cheaply made internal UV Filters including INCORRECT flow rates! We should also note that even these more heavy duty SunSun Internal UV Pump/Filters are still a more basic UV Sterilizer as per the level of UV Sterilization, quality of construction, Dwell Time, and more. If you are a serious aquarist or pond keeper looking for the best in UV Sterilization, please consider spending more, but getting MUCH more with the TMC Vecton and Advantage UV Sterilizers. CUP-613; OUR RECOMMENDED & BEST IN CLASS MODEL! Horizontal installation will achieve slightly higher flow rates and is recommended for ponds while Vertical installation will achieve slightly lower flow rates and is recommended for aquarium installations. •	Suggested Maximum Aquarium/Pond Size (as per scientific UV-C calculations, not manufacturer claims! ); 150/200 Gallons for Aquariums (CUP-609/CUP-613) and 1000/1500 gallons for Pond Green Water Control (CUP-609/CUP-613) . Please note the above aquarium/pond sizes are maximums and at maximum these numbers are best case scenarios. For larger Aquariums/Ponds or less than perfect scenarios, we suggest a stand alone UV such as the Terminator or the professional TMC Vecton/Advantage. •	One Year Warranty on Pump and Ballast, 6 Months for UVC Lamp/Bulb, quartz sleeve warranted to arrive unbroken (no further warranty as these normally do not have defects and only break from mishandling). •	By their design, NO Submersible UV Sterilizer is long lived as per our professional aquarium maintenance companies extensive testing. 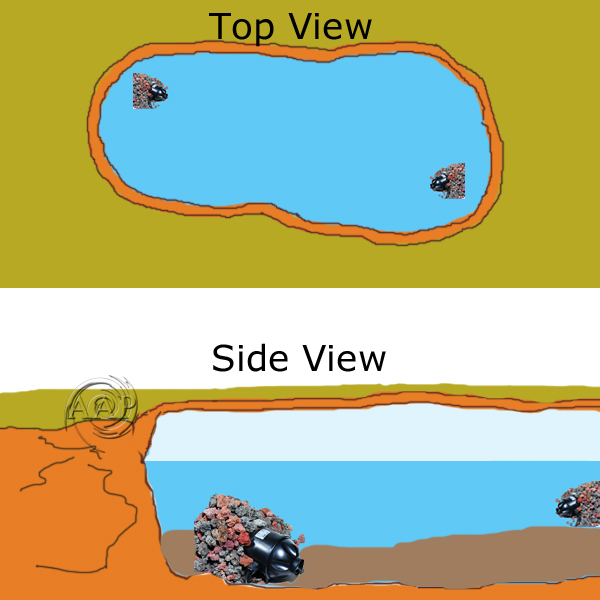 The Picture to the left demonstrates a suggested use with Volcanic Rock (or similar substrate) placed over the intake of the Internal UV Pump Filter. This will act as a pre-filter to allow larger debris common to pond applications from quickly clogging your UV Pump Filter, thus extending running times between sponge cleanings, extending the life of the UV, and simply allowing for better pons filtration and clarification. This is not necessary for aquarium applications and even for pond applications is not essential, but our experience has shown your device will provide much better results and an extended life is this or similar pre-filtration is performed. For larger ponds, two or more of the CUP-13 model placed strategically around your pond can work well for a VERY simple to install (no plumbing needed!) pond green water control system, even in ponds over 2500 gallons. Two CUP-13 UV Pumps can maintain an otherwise correctly set-up pond for effective green water control. See the picture to the left, please click to enlarge. 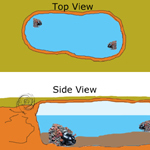 See Pond Care Information for more about correct pond set up including a Pond Veggie Filter. 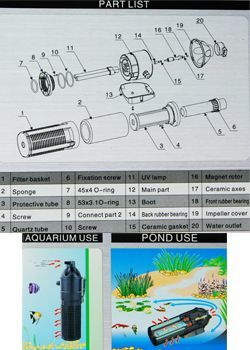 *The SunSun UV Pump (as with ALL internal UV Pumps) is only designed for underwater of surface flow of water, the pump impeller design is not intended to generate the head pressure to run other devices (such as pond spitters, fountains or aquarium fluidized sand filters), pond water falls, or move water from a sump to the main aquarium. Unfortunately some sellers/manufacturers of these or similar Internal UV pumps have made these claims, but this is patently false. However when used inside an aquarium or small pond as these are designed for, your results can/will be excellent! 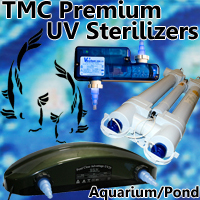 Tropic Marine Center Vecton & Pond Advantage Professional UV Sterilizers for Ponds or aquariums. There are no better UVC Sterilizers at Any price! Solid durable construction Terminator UV Sterilizers, Clarifiers, UV Filter Kits for aquariums and ponds. 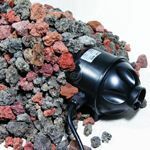 ATI Hydro Sponge Aquarium Filters for bio and mechanical aquarium filtration. New Hydrosponge Pro filter for high bio load tanks. *Rinse the Sponge at least once per month in de-chlorinated tap or used aquarium water (never straight tap water). 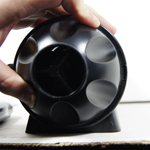 *Also during this sponge maintenance, we recommend cleaning your impeller and impeller well as you should ANY electromagnetic vibration aquarium or pond pump. Make sure the flow is NEVER impeded, as this can damage the impeller, impeller shaft or impeller well. In uses where organic load is high, such as ponds, this becomes even more important and why we suggest further pre-filtration with volcanic rock or similar. Please click on the picture above for a larger animated picture demonstrating how to service the impeller. Copyright © 2019, American Aquarium Products. All rights reserved.